As a way of celebrating the publication of this year’s BMSEC volume, Christian Theology and Its Institutions in the Early Roman Empire: Prolegomena to a History of Early Christian Theology (cf. here! ), today’s “German scholars” post is devoted to Christoph Markschies (cf. here), Professor of Ancient Christianity (Patristics) at the Humboldt-Universität zu Berlin. For my other posts on this book, see here. For my other “German scholars” posts, see here. English Translation (page xvii-xix): By paying attention to the institutional contexts, I aim to avoid having only isolated segments of ancient Christianity come into view in this book, for example, by considering only a type of theology (e.g., the type that refers to the frames of reference of Platonic philosophy and shapes western Christian theology to some extent up to the present) or only a single region (Rome or precisely not Rome, depending on the confessional form) or only a certain social milieu (e.g., the social standing of those supported by communities and Christian teachers working in their educational institutions). For this reason, in the first main section of this book, I have especially directed my attention to the different institutional contexts in which Christian theologies were developed in the second and third centuries CE. I have investigated the development and change of such institutions and given consideration to public situations of communication—namely, pagan and Christian school contexts—but also, for example, the conditions at the great imperial and private estates. The differences and commonalities between Christian and pagan institutions are also dealt with, at least in the form of an overview. German Version (pages 2-3): Durch die Beachtung der institutionellen Kontexte sollte vermieden werden, daß in diesem Buch nur Segmente des antiken Christentums isoliert in den Blick geraten, indem z.B. nur ein Typus von Theologie berücksichtigt wird (etwa der, der sich auf den Referenzrahmen platonischer Philosophie bezieht und in gewisser Weise bis heute abendländische christliche Theologie prägt) oder nur eine Region (je nach konfessioneller Ausprägung: Rom bzw. gerade nicht Rom) oder nur ein bestimmtes soziales Milieu (etwa der Stand von Gemeinden besoldeten und in deren Ausbildungseinrichtungen tätigen christlichen Lehrer). Deswegen habe ich in einem ersten Hauptteil dieses Buches mein Augenmerk besonders auf die unterschiedlichen institutionellen Kontexte zu richten versucht, in denen im zweiten und dritten nachchristlichen Jahrhundert christliche Theologien entwickelt wurden, habe die Entwicklung und Veränderung solcher Institutionen untersucht und öffentliche Kommunikationssituationen, pagane wie christliche Schulzusammenhänge, aber z.B. auch die Verhältnisse auf den großen kaiserlichen und privaten Landgütern in den Blick genommen. Auch die Unterschiede und Gemeinsamkeiten zwischen christlichen und paganen Institutionen werden wenigstens im Überblick behandelt“. 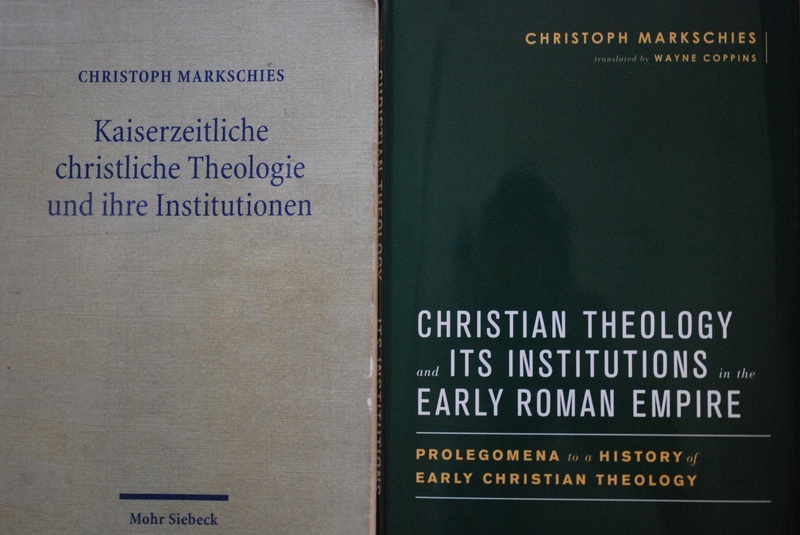 For Christoph Markschies’s publications, see here (English), here (complete), and here (academia.edu). For audio-video material of Markschies, see here. Research: “Ancient Christianity” with a particular focus on the intellectual history and history of ideas (history of Trinitarian theology), the marginalised movements of the majority church (so-called Gnosticism and Montanism), the transformation of the (Platonic) philosophy in Christian theology and the history of the body in Ancient Christianity within the context of other religions and movements. – The academic history of the discipline with a special focus on the Berlin faculty and the Academy of Sciences. Academic Biography: Born in 1962 in Berlin, Christoph Markschies studied Protestant Theology, Classical Philology and Philosophy in Marburg, Jerusalem, Munich and Tübingen. He qualified in 1991 as Dr. theol., attained his habilitation in 1994 and, following professorships in Jena (1994-2000) and Heidelberg (2000-2004), has been Professor for Ancient Christianity at the Humboldt-Universität zu Berlin since 2004. He was President of this university from 2006 to 2010 and has been Vice-President of the Berlin-Brandenburg Academy of the Sciences and Humanities since 2012. He was awarded the Leibniz Prize in 2001.